Way up in Adirondack Park, some 50 miles south of the Canadian border, Saranac Lake beckons travelers to its peaceful shores. Tucked away in the land of loons and endless, tree-covered mountains, the town, about 10 miles from Lake Placid, serves as an ideal base for exploring the Adirondack wilderness. The main attraction around the the Saranac Lake area is, of course, the natural landscape, and there’s no better way to explore than by canoe. 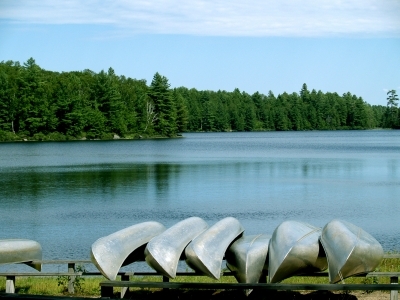 Lower and Middle Saranac Lakes are connected via water, so even novice paddlers can explore them. Campgrounds start at $20 per night, and must be reserved in advance. (Island sites are highly recommended for a truly special experience.) There are a number of canoe outfitters in and around town, so you don’t need to have your own gear. If you prefer to keep your feet on the ground, Saranac Lake’s position on the fringe of the Adirondacks’ High Peaks region makes for great hiking nearby. Many of the state’s highest mountains (including the highest, Mt. Marcy, at more than 5,000 feet) can be done in a day if you start early. Summer is event season in the region, starting off with Great Adirondack Days July 4 to 6, Woodsmen’s Days in nearby Tupper Lake July 12 to 13, and the Ironman Triathlon in Lake Placid on July 20. Summer winds down with the Adirondack Canoe Classic, a 90-mile race from Old Forge to Saranac Lake from September 5 through 7, and the second annual Artists at Work Studio Tour September 27 to 29. For something to do anytime, the Wild Center in Tupper Lake immerses visitors in the Adirondacks’ natural history. If you want, brave the crowds and reminisce at the Olympic venues in Lake Placid. The Saranac Lake Area Chamber of Commerce’s website is the best place to plan a getaway here, with information on events, dining, and accommodations. Have a recommendation for Saranac Lake, or another great getaway in New York? Post your comment below!